First of all, I do want to commend Webroot for creating a fascinating Internet security suite. 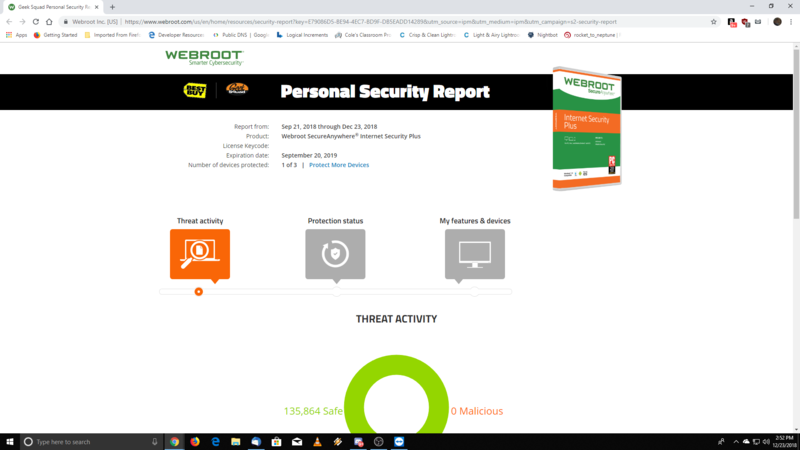 I've used Norton, McAfee, AVG, and Kaspersky products, and I find that Webroot SecureAnywhere Internet Security Plus keeps my computer protected from many threats. With that being said, I am not a big fan of notifications popping up while I'm using my computer unless the notification requires me to take action for something. Unfortunately, I have not found a way to disable the Webroot SecureAnywhere Personal Security Report notification from appearing. If there is a setting that disables it, I am overlooking it. If anyone knows how to disable this notification, it would be a great benefit to myself and many others that use Webroot SecureAnywhere Internet SecurityPlus. First of all, I do want to commend Webroot for creating a fascinating Internet security suite ... I find that Webroot SecureAnywhere Internet Security Plus keeps my computer protected from many threats. Unfortunately, I have not found a way to disable the Webroot SecureAnywhere Personal Security Report notification from appearing.